LED Infrared Light Therapy… Fight Pain and Speed Up Healing! 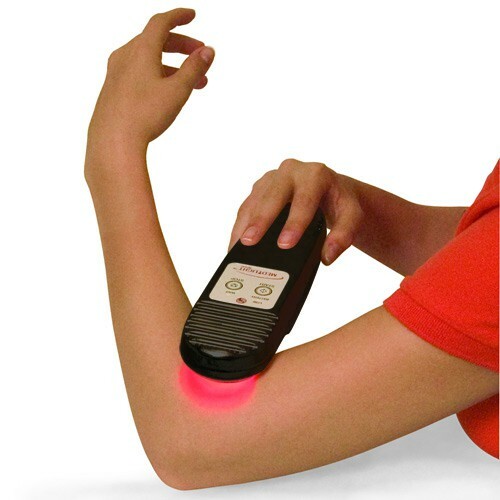 You may not know about the amazing uses of LED infrared light for common injuries and conditions that cause people pain, nerve damage, muscular damage, and inflammation! It enhances the body’s ability to heal itself by emitting a light that penetrates deeply beneath the skin. It is then absorbed by the mitochondria of the cells. This also causes an increase in production of collagen and protein in the cells. It proves especially beneficial for chronic pain and injuries. Many patients find quick pain relief caused by debilitating chronic diseases with this technique and see improved functionality in little to no time after treatments. Damaged tissue repairs faster and stronger with the aid of LED infrared light. Not only does recent research support these findings, it supports increased functionality of the injury or area in pain as well as improved range of motion. Call our office to see if LED Infrared Light Therapy can help you with your chronic pain, inflammation, or injury and get you back to a healthy, pain-free life! Kinesiology Tape: Does it Work? Olympians, triathletes, volleyball players, and weekend warriors use kinesio tape and claim that it helps them perform. So what does the tape do for these athletes? The purpose of kinesiology tape is to improve circulation, support muscles, and help heal and prevent muscle injury. The tape allows freedom of the muscle to move creating circulation, which brings oxygen and nutrients to that area of the body being taped. This aids to speed up the healing process. This tape was designed by Dr. Kenzo Kase, a Chiropractor and acupuncturist. He believed a flexible tape would create better circulation and would be less restrictive for the athlete. The tape is a latex-free hypoallergenic cotton fiber material. The tape is sweat-proof so it holds strong during intense workout. It can get wet and can be worn in a pool and shower. The tape, when applied correctly, can last for three to five days. Michael has had constant pain in his wrists, hands, shoulders, knees, and feet for years. He has had muscle tension and tightness in his low back. He attended 24 physical therapy treatments and the pain still persisted. He was taking 4 to 8 Ibuprofen a day. He also had to stop yoga practice. Michael has now gone down to two ibuprofen per day and has less pain in his hands, no foot pain, and less pain in his shoulders and body. He’s very pleased with the chiropractic treatment plan Dr. Amber prescribed. He has received gentle chiropractic adjustments as well as vibration therapy for muscle tension and scar tissue. He is looking forward to returning to yoga practice. Sports Injury or Sports Injury Prevention? If a parent is supporting a child in a team sport, the investment of prevention of sports related injuries is priceless. As Chiropractors, we evaluate the neurological, skeletal, and musculoskeletal systems. We are able to address the flaws in the biomechanics of the body to avoid injury. These flaws are often asymptomatic and are over looked. Chiropractors spot these postural problems. We put together specific rehab programs and stabilization programs to strengthen and prevent injury in youths who play sports. Contact sports have a high rate of traumatic brain injuries. These sports include high school football, soccer, lacrosse, hockey, and wrestling. The CDC reports “During 2001–2005, an estimated 207,830 emergency department (ED) visits for concussions and other TBIs related to sports and recreation activities were reported annually, with 65% of TBIs occurring among children aged 5–18 years.” It is imperative to be aware of the signs and symptoms of a concussion. The neurological and musculoskeletal injury to the body needs to be addressed and treated. Chiropractic will help speed up recovery and prevent scar tissue and instabilities of these systems. Repetitive injuries should also be mentioned. Overuse of joints in recreational sports effect the body long term. Athletics such as gymnastics, cheer, karate, and dance can have long-term damage on the body if not treated properly. Stretching, muscle work, and chiropractic offer that type of treatment. These types of treatments are gentle and effective, not only to prevent injury, but also to keep the individual agile and strong. Scar tissue forms in the body as a temporary patching mechanism for wounds caused by surgery, trauma and/or repetitive stress. This scar tissue can connect tissues that are not normally connected and these connections are called adhesions. Adhesions can entrap nerves, cause pain or numbness and limit ones range of motion. RRT uses vibratory therapy that targets these adhesions and breaks up the scar tissue that relieving pain in a quick, safe, comfortable, affordable and non-pharmaceutical method. Are you suffering from pain? Do you want to treat the underlying cause of the pain rather than mask it with medications?